A shame former Accept guitarist Herman Frank is no longer a part of Pänzer; you know, the guy who wasn’t allowed anywhere near the songwriting process for the long-running German metal troupe. It was Frank’s nimble guitar playing that gave Pänzer’s 2014 Send Them All to Hell its identity. Well, that, and Destruction lead-man Schmier’s flaming pipes. Pänzer has since recruited current Hammerfall axe-slinger Pontus Norgren and Gurd guitarist V.O. Pulver (former Accept drummer Stefan Schwarzmann is still pounding the skins). The reformatted unit has returned with Fatal Command, an album, despite its cartoonish cover (no, we won’t go there), has the necessary German steel and grit to more than get by. Somewhat less thrashy than its predecessor, Fatal Command finds itself relying quite heavily on Schmier. In Destruction, Schmier more or less has to find his footing around Mike Sifringer’s always-dominant riffs. Since Pänzer would probably be a power metal band with a clean singer in tow, Schmier is left to craft hookier vocal lines. And largely, he does. The rollicking “Satan’s Hollow” and punchy title track are expedient, the latter tailor-made for Schmier’s acidic vocals. 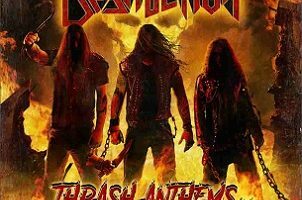 However, it’s the very Accept-like (no, seriously) “I’ll Bring You the Night” that finds the indomitable Destruction throat unleashing some of his best singing in years. 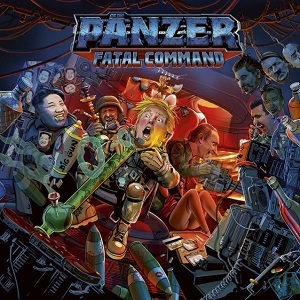 Pänzer may get a little too comfortable with one tempo across Fatal Command, but there’s no duds across the album’s 12 songs. Aside from the aforementioned “I’ll Bring You the Night,” we’ll point to “Afflicted” and “Wheels of Steel” as the album’s choice cut, even if the latter nicks from a Saxon song. Ah, doesn’t really matter, nor does the fact Norgren is a Swede. Pänzer remains the embodiment of tried-and-true German metal. See you at festival season.